For the Peggy Lee album, see Make It with You (album). 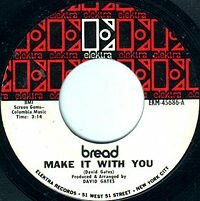 "Why Do You Keep Me Waiting"
(1969) "Make It with You"
(1970) "It Don't Matter to Me"
"Make It with You" is a song written by David Gates and originally recorded by the pop-rock group Bread, of which Gates was a member. Only Gates and drummer Mike Botts appear on the song which was a #1 hit. The song first appeared on Bread's 1970 album, On the Waters. Released as a single that June, it was the group's first top-ten hit on the Billboard Hot 100 singles chart and spent the week of August 22, 1970, at number one, their only single to do so; it also reached #5 on the UK Singles Chart. Billboard ranked "Make It with You" as the No. 13 song of 1970, and it was certified gold by the RIAA for sales of over one million copies. Peggy Lee, Cleo Laine, The Supremes, Aretha Franklin, Christian Bautista, Earth, Wind & Fire, Dusty Springfield, Nancy Wilson, Cilla Black, the Originals, the Main Ingredient, the Whispers, Marc Anthony, Teddy Pendergrass, Don Julian & the Larks, Let Loose, Dennis Brown, Andy Williams, Lou Donaldson, Tony Mottola, The Pasadenas, Robert Finley and Marc Cohn have all recorded cover versions of "Make It with You." Ralfi Pagan reached #32 on the Billboard R&B chart in the summer of 1971 with a Latin-soul version of the song. It has also been recorded in Spanish as "Cerca de ti" (Barrio Boyzz, 1993) and "Quiero hacerte el amor" (M.C. Blvd., 1996). ^ a b "Bread - Retrospective". Albumlinernotes.com. 1940-12-11. Retrieved 2016-10-03. ^ "The Irish Charts – Search Results – Make It with You". Irish Singles Chart. Retrieved July 1, 2018. ^ "Top 100 Hits of 1970/Top 100 Songs of 1970". Musicoutfitters.com. Retrieved 2016-10-03. This page was last edited on 24 March 2019, at 16:15 (UTC).